Have 48 Hours in Charleston? Here Are Three Things You Must Do! I have a simple question. Can I go back to Charleston already? I went to Charleston last week with my hubby for a quick getaway to celebrate our fourth wedding anniversary and the trip went by entirely too fast. We'd been wanting to check out Charleston for the last few years and I was so happy we were finally able to go. Charleston is such a charming place. Plus, with just a four hour drive from Greensboro, it was the ideal location for a change in scenery without being far from home. With only 48 hours in America's favorite destination, what did we do? The answer is plenty. Now typically when my husband and I travel, our goal is to travel as affordably as possible; however, we opted to shorten our trip to two days so we could splurge on all the good eats and fun. Thanks to the great staff at Explore Charleston, Charleston Harbor Tours and the Hyatt Place Charleston Airport, we managed to fit in great food, incredible history and a little dancing on our trip. 1. Eat at Hyman's Seafood. No, really... You have to. While enjoying the manager's reception at our hotel, we befriended one of the hotel's supervisors, Richard. We told Richard it was our first time in Charleston and he immediately told us we had to have dinner at Hyman's Seafood. He raved about their shrimp and grits! It sounded so delicious so after checking them out on Google and seeing all of the amazing reviews, we headed there. Hyman's Seafood was easy to find and we immediately saw how popular this place is. There was a line outside, but surprisingly, we waited only about 10 minutes for a table. We sat upstairs near a window with a view. It was not long before our waitor came and introduced himself. Their menu is pretty expansive so we decided to make it easy on ourselves. I had the Carolina Delight, which is their unique take on shrimp and grits that Richard recommended earlier, and my husband had the Shrimp Feast. That's not it, though! While we waited for our entree, we were given a complimentary appetizer, Wadamalaw Delight, which is fried green tomatoes served over grits with all this ooey gooey cheese. Yummy! You also receive complimentary hushpuppies and boiled peanuts. Plus, each entree comes with a side. Our table was covered in delicious food and we, of course, could not eat it all. The flavors of every single piece of our meal were incredible. So delicious and fresh! Not to mention, the drinks are pretty darn good too. I had a peach margarita that was made to perfection. I have thought about this food just about everyday since our trip. Can you blame me though? Cost: Varies. Learn more here. 2. Visit Magnolia Plantation and Gardens. The history is incredible! When my husband and I travel, we always like to include a history lesson in our trip. We enjoy beautiful places, but we know that every place has a story. Charleston has many stories and quite a few of those stories start at plantations. There are several plantations in Charleston, but we only had enough time to visit one so we decided to visit the Magnolia Plantation and Gardens. Magnolia Plantation is not only known for it's beautiful gardens, but it was also the home to slaves where they harvested rice. Each tour really taught us so much history of the plantation from how slaves created the ricefields to seeing actual slave quarters. It meant a lot to us that we were able to spend time learning about our ancestors. We spent just over five hours at the plantation and still did not see the entire property. I would love to return to explore soon. Cost: $20 for adults, $10 for children 6-12 and free for children 5 and under. Guided tours are an additional $8 each for adults and children 6-12. Guided tours are free for children 5 and under. Learn more here. 3. Hop on Charleston Harbor Tours' Blues and BBQ Cruise. You will be dancing and enjoying yourself! We decided to spend our last night in Charleston having some fun. I wanted to make sure that our anniversary ended with two things we love, great music and delicious food. Before heading to Charleston, I learned about the Charleston Harbor Tours thanks to Explore Charleston. Charleston Harbor Tours offers a variety of boat tours, including daily tours and special cruises. Their Blues & BBQ Cruise immediately caught my attention as I was looking at their monthly calendar. The Blues & BBQ Cruise sails one to two times a week, March through November, and includes two hours of blues and great food. Their weekly cruise happened to fall right on our anniversary, which was perfect! 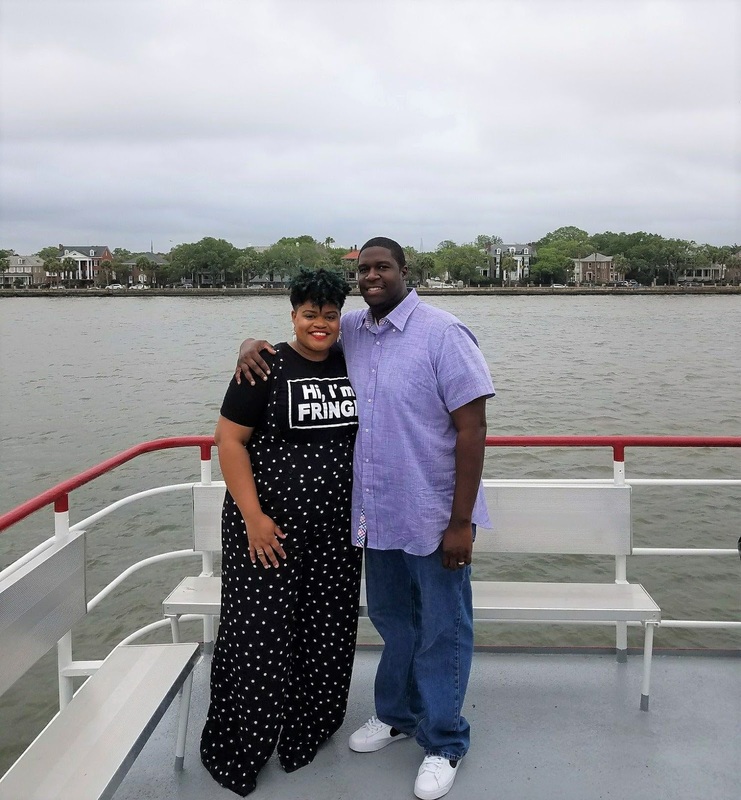 We boarded the Carolina Queen and spent two hours sailing around Charleston seeing sights like Fort Sumter, USS Yorktown and more. The Carolina Queen has three levels, including the top which gives you amazing views of the water and shore, the middle where you could enjoy the band and purchase drinks and the bottom level where dinner was located. We enjoyed barbecue, chicken, macaroni and cheese (...which someone needs to give me the recipe for) and desserts. The food was excellent! Plus, the band, Shrimp City Slim, was so good! I was shimmying without a care in the world on the boat. My husband said this cruise was his favorite part of our trip! I would have to agree. Cost: Starts at $45.95 for adults. Learn more here. I received complimentary tickets to attractions in exchange for this post. As always, all thoughts and opinions are my own.